About a month ago, a loyal follower emailed me a photo of a braided hairstyle , asking if I could replicate it and possibly do a tutorial. Never having seen it before, I was fascinated with how it looked and spent an hour or so trying to recreate it. When I first posted the video on YouTube, a viewer commented that he had seen this braid style used on horse tails in horse competitions, etc. 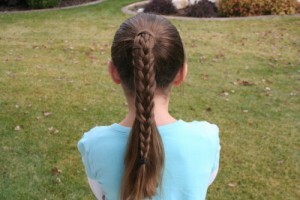 I can only describe this style as a Fishtail Braid that uses three strands (as in a typical braid) rather than two. 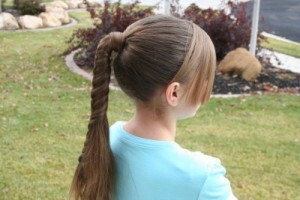 I think that this is a beautiful braid… good enough to not only be worn on horse tails! I coupled the style with the Hair-Wrapped Ponytail as a starting point. You could even opposing-curl strands of the remaining ponytail hair to add additional flair to the style! My #2 daugther was stopped time and time again in the hall at church this past Sunday by moms trying to figure out exactly how this hairstyle was done. Personally, I think that the braid looks more amazing by using even smaller strands from the back. Items Needed: Rat-tail comb, water bottle, and 2 ponytail holders. If you like this braided hairstyle, be sure to let us know! Happy Hairdoing!